The Lasso is writing a three-part series, looking into the issue of college drop-outs and how that applies to Texas Woman’s University students. Students look forward to a bright future when they sign up for their first term at university. Yet according to collegeatlas.org, 30 percent of students drop out after their first year. The alarming rate of college dropouts shows that somewhere along the way — dreams turned to dust for some of those students. There are several economic or sociological reasons why students simply can’t handle the pressure or workload anymore. College Atlas also points out that most often the struggle of balancing school, work and family overwhelms students and mental or physical deterioration is a common result. The National Center for Education Statistics states that 59 percent of first-time, full-time students will graduate within 6 years of starting at a 4-year institution. Even though higher education institutions expect students to graduate within four years, national and regional statistics focus on a 6-year degree time frame because the number of students graduating with four years is actually very low, about 39 percent. Texas Woman’s University’s graduation rates actually lie below the national average. 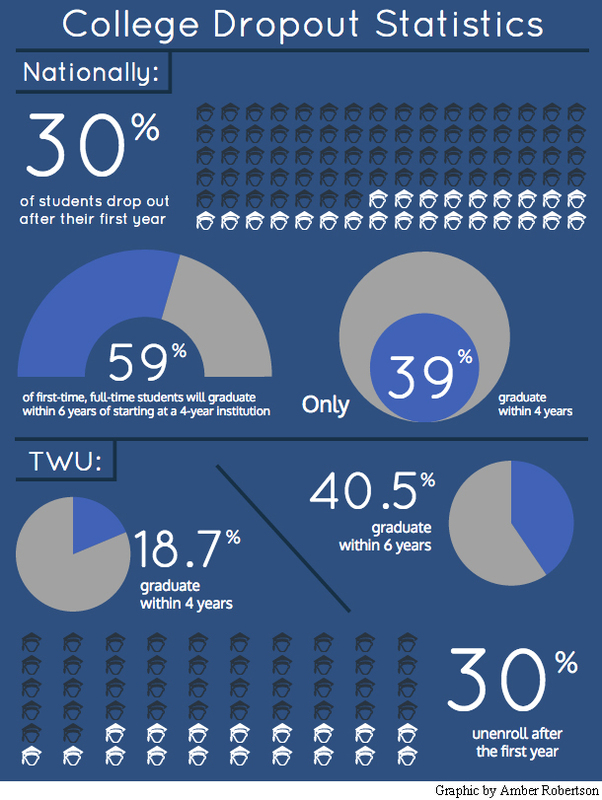 According to TWU’s retention rate statistics, published online, of the students enrolled at the institution only 18.7 percent graduate within four years and 40.5 percent graduate within 6 years. The resulting unenrollment rate is about 30 percent after the first year, whether those students transferred or dropped out is unclear. In a chance meeting, The Lasso encountered Andrew Sharp, a former University of North Texas student who was willing to share his story of dropping out: personal struggles, mistakes and lessons learned. Sharp was a first-time and full-time Computer Engineering student at UNT before things started to fall apart. 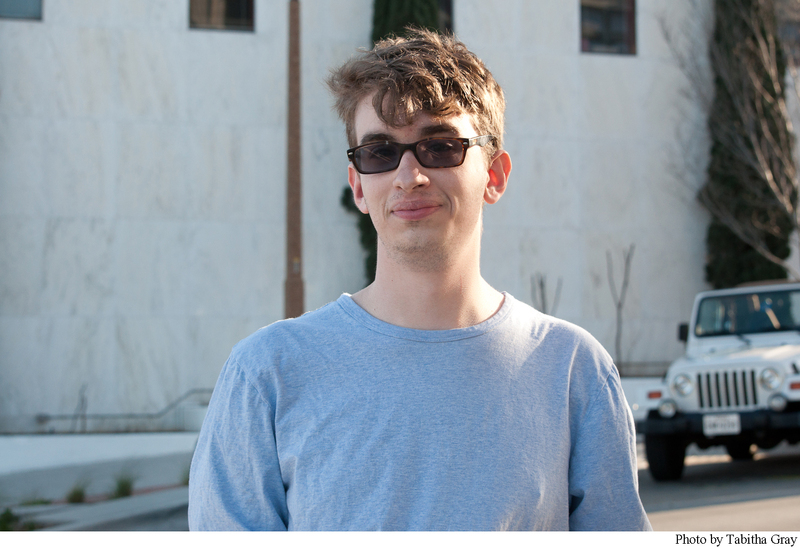 Andrew Sharp talks with The Lasso’s Emily Nickles about his college experience. Under the influence of a chemical imbalance out of his control, Sharp dropped out of school the beginning of his sophomore year in Fall 2015. He now works two waiting jobs at 60 hours per week in order to support himself. Struggling with depression felt normal for him, it was something he was used to – what Sharp termed “coexistence.” Only recently has been instigating change in his life: “I’ve realized that I need to be in control of this and actually continue on in life. I am actually requesting to receive financial aid again… I’m planning to go back to school, but right now I’m just living life,” acknowledged Sharp. Sharp humbly noted that it’s going to be more difficult to get back into school than it was before—especially since he will need financial aid. He commented that the process had “a lot of red tape” and documentation needed to prove that he had a valid reason for his then low performance in classes. The current trend for handling the rate of college drop outs is to not handle it at all. Nothing is really being done to figure out what factors cause students to make this decision or what circumstances force them into this decision. For Sharp, dropping out was due to a combination of mental health and the resulting financial dependency, for many other students it could include any link between health, financial stability, family, work and life balance.